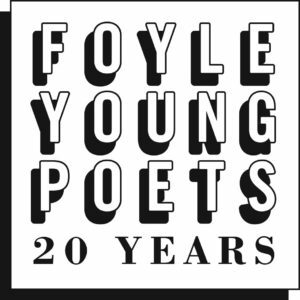 Our Foyle Young Poets intern Maud Mullan reviews the second Young Poets Takeover, a performance by young poets at The Poetry Café on 21 August 2018. Foyrè Jalloh. Photo credit: Cesare de Giglio for The Poetry Society. On a quiet London street, a few passers-by glanced curiously at the loud, chattering group spilling out of The Poetry Café at 3pm on a Tuesday afternoon. 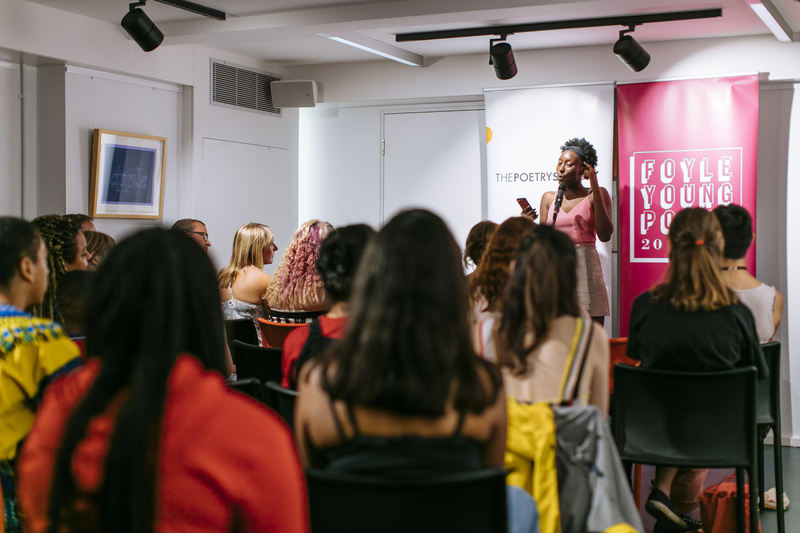 We were here for the second ever Young Poets Takeover – a performance by poets under 25. Some were already experienced performers and prize-winners, while others were sharing their poetry on stage for the first time – but all held the audience’s complete attention with their energy and talent. The result was two highly entertaining hours, in which this new generation of young poets took it in turns to make us laugh, think, and above all admire the maturity and creativity of their work. 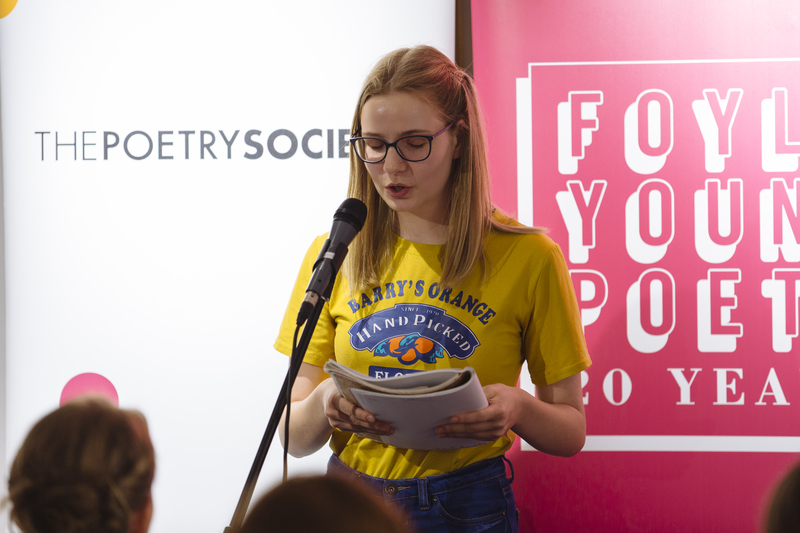 Helen Bowell, Education Co-ordinator at The Poetry Society, and former Foyle Young Poet, began the takeover by reading two of her own poems, as well as delivering a reminder to the performers to ‘never apologise for your work’. This was a message that all the poets seemed to take to heart – while there were some shaking hands and admissions of nerves, everyone performed with enthusiasm and confidence. Then came the main event – first four poets who were either Foyle Young Poets, SLAMbassadors or Young Poets Network challenge winners, followed by nine open mic performers, and finally three more former prize-winners to close the show. A striking feature of the Young Poets Takeover was the sheer range of work on display. From written poems scribbled in notebooks, read off smartphones or committed to memory, to spoken word poetry and one rap – the variety was truly impressive. Some poets performed both page poems and spoken word poetry, showing their artistic versatility. The oldest reader was 22, the youngest only 7. Lucy Tiller. Photo credit: Cesare de Giglio for The Poetry Society. During the interval we all ascended to the sunlight of a summer afternoon in The Poetry Café, where the readers chatted over slices of cake and introduced themselves to each other. Some had come with friends or parents, others on their own, but after seeing many young poets warmly praise each other’s performances, and talk about their experiences with poetry and plans for their work in the future, I was surprised to learn that most had only just met each other that afternoon. The Takeover then continued with an open mic performance, for any young poets who’d come along and wanted to perform. All the open mic slots were taken, showing an impressive level of enthusiasm. The breadth and depth of the work on show was remarkable. Poems treated diverse subjects, with some taking inspiration from the natural world, or finding the extraordinary in everyday experiences, such as fourteen-year-old former Foyle Young Poet Meredith LeMaître’s untitled poem about a weekend in May that evoked the bright flavour of ‘Tango Orange’ and the warm atmosphere of a summer day when ‘we were all falling for each other, like skittles’. Others preferred to focus on causes that meant something important to them, whether treated comically, as in Nadia Lines’ ‘Divorce Proceedings’, about moving on from coal powered energy; or to empower listeners, as in Foyrè Jalloh’s ‘You Are’, a bold spoken word piece tackling female insecurity. We heard responses to both personal and political themes – from grief, love and family, to race, gender, nationality and climate change. What all these performances had in common was their treatment of issues that deeply affected the poets, and, judging by the audience’s reception, that affected others too. Perhaps the aspect of the Takeover that made the strongest impression was the maturity and self-belief of the performers, despite some initial nerves. Even the youngest reader, seven-year-old Zephaniah, managed to crack some jokes with the audience, and wasn’t afraid to create bold and memorable images, such as the comparison ‘tragedy is like salted butter, both full of dangerous fat’. For some of these poets this was the first time they had put their work out there to be taken seriously. For others it was another step in a long road – many of these poets already boasted a startling number of achievements: having performed on BBC Radio 4, been published in books and anthologies, and even having edited their own zines and collections. These poets may have been young, but they certainly weren’t inexperienced. And as they all said their goodbyes and congratulated each other on their performances, there seemed little doubt that, whether this was the first time they had put their poetry on show or not, it certainly wouldn’t be the last.